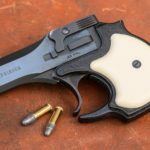 Following your response to the poll we ran back in February, we’ve been focusing on the topic of concealed firearms throughout the Spring at Lucky Gunner Lounge. 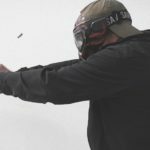 Most of the content so far has revolved around gear and techniques for carrying concealed handguns. But as I promised back when the poll results came in, our coverage of “concealed firearms” will be broader than just handguns, so now it’s time for something completely different. In just the last couple of years, we’ve seen dozens of products pop onto the market that offer alternative ways for storing and hiding guns in your home besides the traditional gun safe. 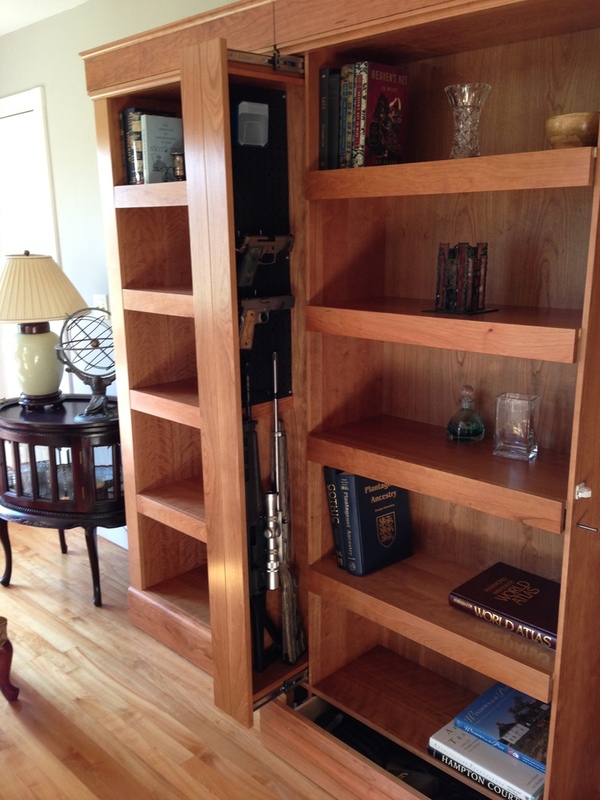 The most popular fad in firearms storage right now seems to be the secret compartment gun cabinet. There’s always been DIY home-made or professional custom one-off furniture available with drawers, shelves, and compartments hidden in every conceivable location, but the small boutique custom furniture shops that specialize in camouflaged gun storage are enjoying a new surge in popularity. Some of the designs are even being mass produced, and the smaller pieces like hallway mirrors and end tables with hidden gun compartments are more affordable than ever. 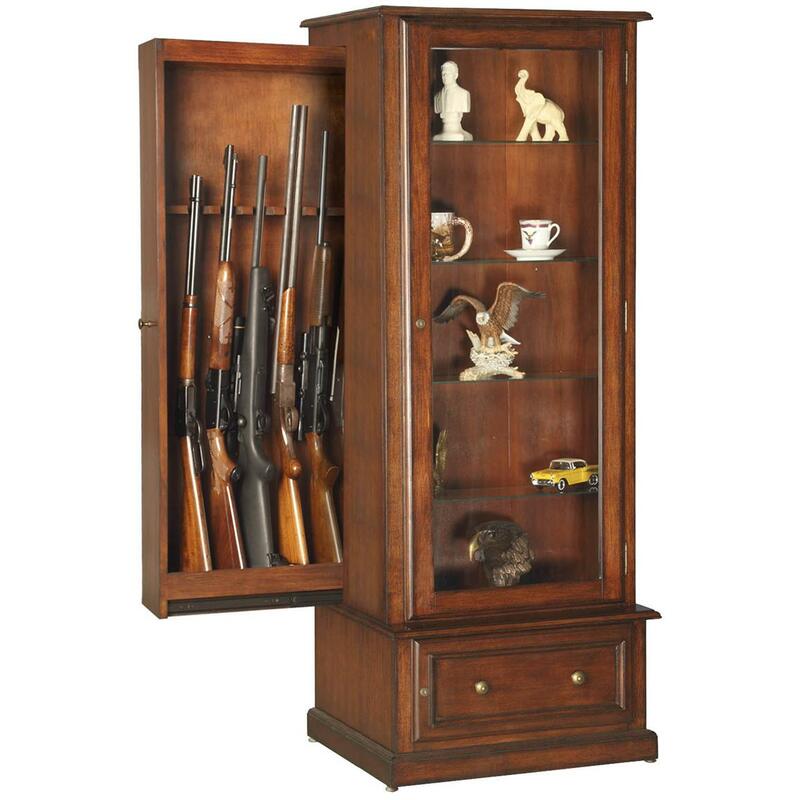 This curio cabinet from American Furniture Classics holds up to ten long guns in a sliding hidden compartment. 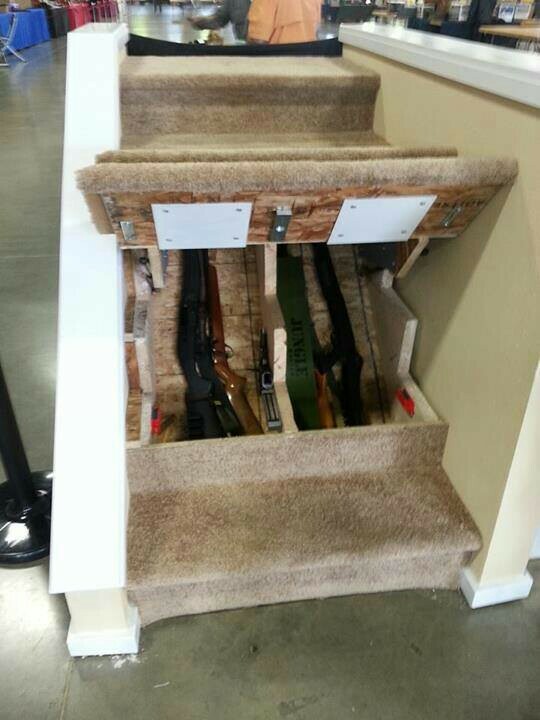 The advantages of hiding firearms inside what appears to be everyday furniture are obvious. It’s a discreet way to keep a self-defense tool handy “just in case”. The need for complex locks or heavy metal doors is not as great since the location of the items is secret. You could conceivably set up your home so that a firearm is always within arm’s reach, no matter where you are in the house. In theory, the unassuming camouflage will fool burglars, small children, or anyone else you don’t wish to have access to your firearms. 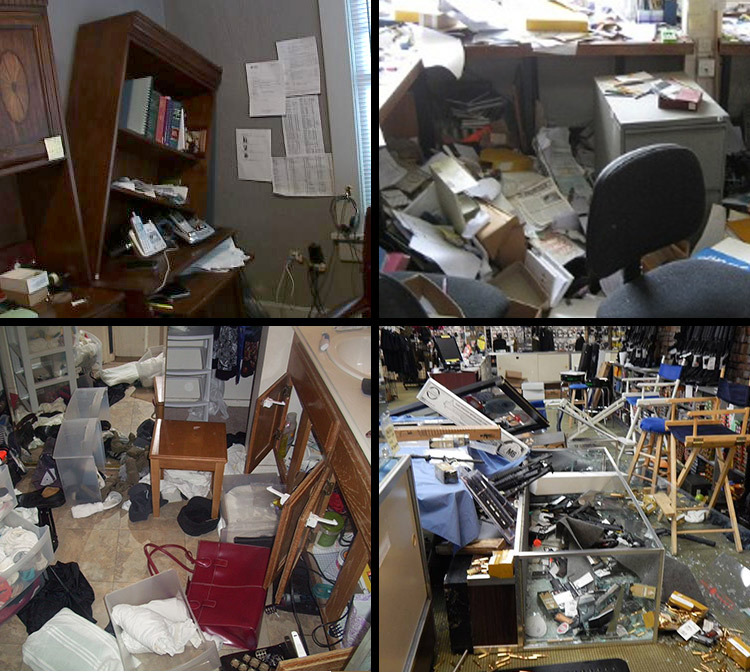 If someone with sticky fingers were to start rummaging through your stuff, who would think to look behind that innocent mirror in the hall, or try to pull out the front of the shelf on your bookcase? “How about a little light reading? Would you prefer the World Atlas, Plantagenet Ancestry, or… oh, forget it, let’s go shooting”. The Safeguard Shelving System from QLine Design. And of course, there’s the undeniable cool factor. You can’t help but get that warm and fuzzy secret agent feeling any time you activate the magnetic switch on your bedside table to reveal a waiting handgun and high powered flashlight. Now imagine your piece of furniture with the clever secret compartment has been tossed over on its side. Will the contents stay hidden? And if you have any other gun accessories laying around, or maybe even a “real” gun safe in addition to that special hiding spot, you’ve just given the burglar a free tip: “This guy has guns.” Now the home invader has motivation to look extra hard for your firearms. Will your efforts to keep those guns hidden hold up to that kind of scrutiny? This point doesn’t require a lot of explanation. Just think back to when you were a kid yourself. You can probably remember a time when adults underestimated you. Maybe you found the Christmas presents in November, or you knew exactly where mom hid your Game Boy when you were grounded. Kids pay attention to details that adults ignore. They also spend a lot of time exploring their surroundings, and that includes poking around at furniture, under beds, and in closets. If you have young kids in your home who don’t know about gun safety, assume that any compartment, safe, box, or closet that isn’t securely locked is accessible to them, which can make hiding guns in your home a bit more difficult. No matter how clever the hiding spot, you can’t trick a house fire into skipping over your hidden gun safe. Though there are some exceptions, most of the secret compartment type furniture is not designed to protect the contents from fire. If you have firearms you consider irreplaceable, make sure they’re stored in a fire-resistant safe. Your local fire department can give you some advice about how long your valuables are likely to last in a fire, if you have any doubts about the manufacturer’s claimed fire rating. 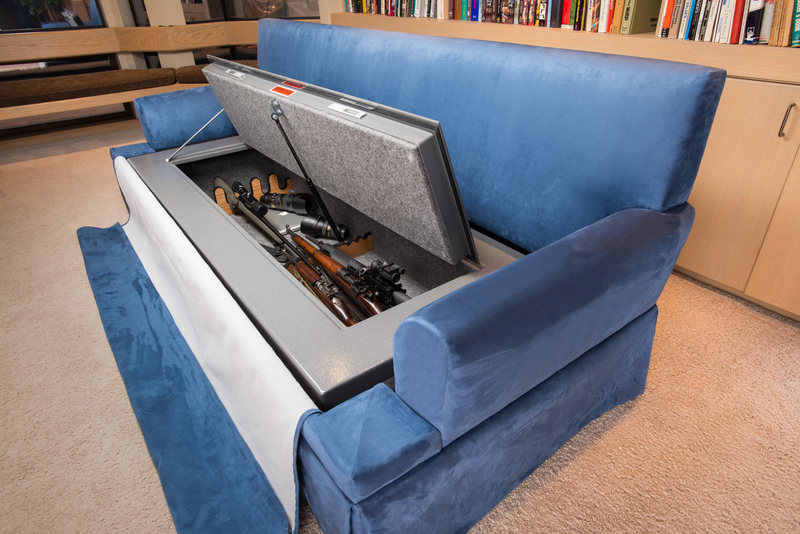 The CouchBunker from the BedBunker company is one hidden gun safe that does come with a fire rating. Just for the safe, though… if there’s a fire, the couch is toast. No gun safe or hiding place is completely invulnerable to theft or fire. So if the worst happens and your whole collection disappears in a break in, your insurance will still cover it, right? Most policies will only cover firearms automatically up to a limit, usually about $2,500. If your gun collection is worth more than that, you’ll need to purchase a rider, or buy firearms insurance from another company. The same rules usually apply to other valuables such as jewelry, coin collections, and hand tools as well. The extra riders are usually affordable. My own insurance company will cover an additional $5,000 worth of firearms for $60 per year, and up to $10,000 for $110 annually. A policy available through the NRA covers a $6,500 collection for $65 per year. For high-value collections, the insurance company may require an itemized list of your collection, along with serial numbers, descriptions, and photographs of each item. According to Department of Justice statistics, 230,000 firearms are stolen every year, most of those from the homes and vehicles of private citizens. In a survey of incarcerated criminals who were arrested while in possession of a firearm, 37% said they obtained their gun through theft or the black market. The number of children accidentally killed by firearms is at an all time low, but it still happens and not all gun safes are as child proof as you might think. Part of being a responsible gun owner is to not make it easy for your guns to be added to those statistics. 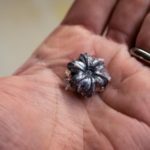 There are dozens of effective ways to store your firearms safely, and whether you choose a traditional safe, or some other hiding spot, be sure to think critically about how hard it really is for a determined person (whether child or criminal) to work their way around your security plan.